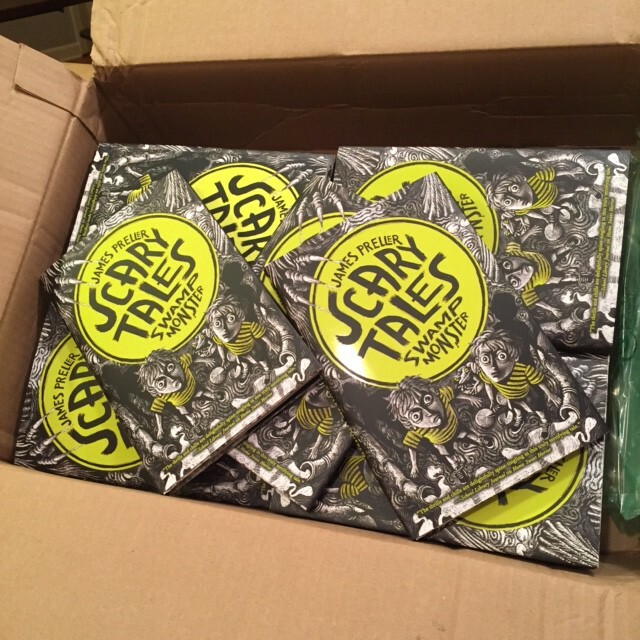 So this box came in the mail containing the “author copies” of the 6th book in my “Scary Tales” series: Swamp Monster. I’m very pleased with the story, the art, the whole she-bang. By way of expressing my thanks, I thought I’d give away FIVE FREE, SIGNED COPIES to the first five people who raise their hand. All you’ve got to do is shoot me an email at Jamespreller@aol.com. Type “SCARY TALES” into the subject heading. Please remember to include your mailing address. If you’d like me to personalize the inscription, don’t forget to include the name. I’m not a mind reader, you know. Thanks for stopping by. I really do appreciate your interest and support. Hope you’re all having a nice summer! NOTE: I’M SORRY, BUT THIS GIVEAWAY IS NOW CLOSED.